With currently more than 214 million members in the US, a 50% daily member login rate and a distribution across different professions, Facebook forms a good basis for recruitment measures. Due to its extensive coverage it is also very possible to transfer learned recruiting approaches to other regions and target groups. People use Facebook in their free time and don't want to be bothered by inappropriate advertising. It is therefore important that only relevant advertising is displayed to the candidate. 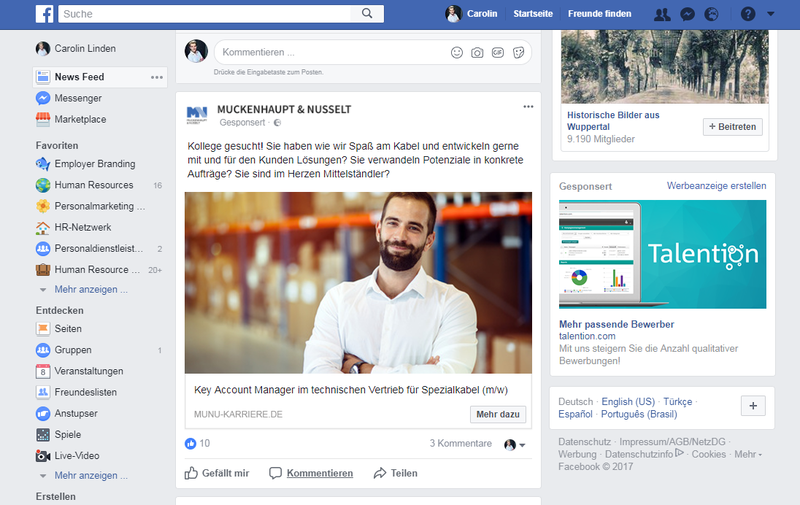 The advantage of Facebook ads is that they can be filtered very precisely, for example by place of residence, age, gender, interests or "I like" information. Use this filter option. Because when a candidate sees a job relevant to them on a Facebook ad, they are much more likely to click on it than if the job doesn't fit. It should be immediately apparent what awaits the candidate. The candidate spends his private time on Facebook and is probably not looking for a job. He must therefore be quickly convinced why he should click on the job offer. So already state the added value of your company and what distinguishes you from your competitors in the advertisement. The candidate must be offered a circumstance which, for example, is not given to him by his current employer. The call to action, i.e. CTA, should be clear and address the candidate. Such a request is essential to ensure that the candidate actually clicks on the ad. Both the image and the text should correspond to the respective target group and be aimed at addressing and reaching them. The creation of Facebook ads therefore plays an important role in social recruiting, as you have an extensive filter function with which you can filter out exactly the right candidates. You should use an individual tracking ID for each ad. Only in this way can you understand in retrospect how many candidates the measure has brought you and which channel is best suited for recruiting. Talention offers you the possibility to evaluate the respective channels. This tells you which ads are successful and are well received by potential candidates. You can also see exactly which channels have caused which costs and where the suitable candidates come from. We would be happy to show you in a free demo how the implementation can look for your company. You can request a free demo here. You will find further resources about social media recruiting in our "Ultimate Guide to Social Media Recruiting".